They're bright and regal colours, so I thought they lent themselves to a birthday card. The water coloured butterfly has a Smoky Slate shadow butterfly, raised on dimensionals to give some lift. I sponged Crushed Curry onto water colour paper, deep at the bottom and then growing lighter. Then I sprinkled some water to lift some colour and give a mottled effect. 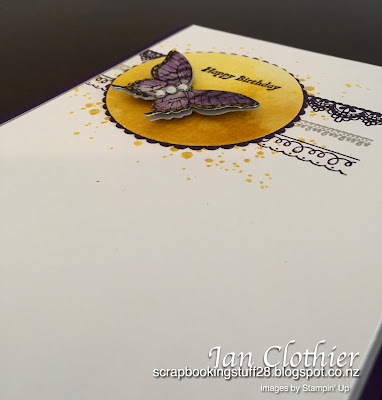 The butterfly is water coloured moving from Smoky Slate in the centre through to shades of Elegant Eggplant, with Crushed Curry at the wing tips. Once it was dry, I gave it a layer of clear Wink of Stella and some rhinestones. Update: Delighted to be a winner at CAS Colours and Sketches with this card. 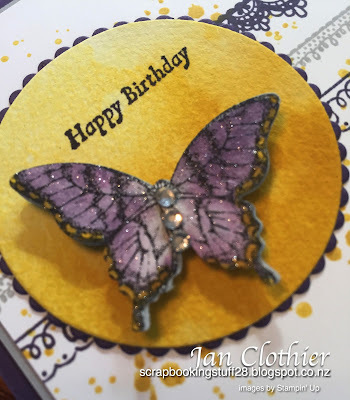 A very elegant CAS card, love the concentration of Crushed Curry on the sponged section behind the butterfly. It really makes it pop. Thanks for joining us on this week's CC&S challenge. Beautiful card! I love the curry watercoloring; gorgeous mottling. And the lace borders behind are wonderful! Thanks for playing along with us at CC&S! Such a stunning card! I love the dimension of the butterfly and how it really pops off the front of the card. Thanks for joining in this week at CC&S!